The 2018 Jeep Grand Cherokee features the legendary ruggedness and off-road capability that you’d expect from Jeep, along with fresh modern style. Both the exterior and interior of the new Jeep Grand Cherokee reflect this philosophy. The exterior of the 2018 Jeep Grand Cherokee has eye-catching and useful features like available LED headlights and available 20-inch wheels. The interior is designed to suit your tastes with a choice of durable cloth or luxurious leather. Customizable digital gauges are standard for optimal readability and maximum information. Test-Drive the 2018 Jeep Grand Cherokee at Bob Moore Chrysler Dodge Jeep RAM of Oklahoma City today. The new Jeep Grand Cherokee’s blend of legendary Jeep toughness and a modern approach also ensures excellent occupant protection. The 2018 Jeep Grand Cherokee is built from the ground up to provide protection in the event of an accident, and further enhanced with advanced safety aids like the available Forward Collision Warning with Active Braking and optional Adaptive Cruise Control with Stop. Check out the safety aids in the new Jeep Grand Cherokee by taking a test drive at Bob Moore Chrysler Dodge Jeep RAM of Oklahoma City today. The 2018 Jeep Grand Cherokee features a variety of different performance levels to suit the tastes of drivers from all walks of life. 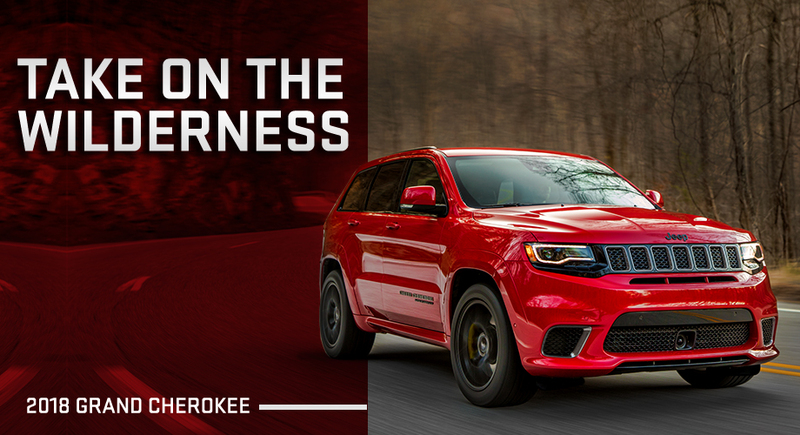 The high-performance new Jeep Grand Cherokee Trackhawk trim has a massive HEMI® V8 producing 707 horsepower, which rockets it from 0-60 MPH in a remarkable 3.5 seconds. Even the most affordable trim, the Laredo, features a powerful 3.6L V6 engine as standard equipment. Take the new Jeep Grand Cherokee for a spin today at Bob Moore Chrysler Dodge Jeep RAM of Oklahoma City today. The new Jeep Grand Cherokee features premium tech features like Bluetooth® Streaming Audio and the Uconnect Voice Command infotainment system as standard. A high-resolution 8.4-inch color touchscreen is available, as is GPS navigation. See how the technology in the 2018 Jeep Grand Cherokee outpaces the tech in competitors, such as the Ford Flex and Honda Pilot by taking a test drive at Bob Moore Chrysler Dodge Jeep RAM of Oklahoma City today.